The Green Point Environmental Learning Center is a 76-acre natural area located within Saginaw, one of Michigan's largest cities, and across the Tittabawassee River from the Shiawassee National Wildlife Refuge, one of Michigan’s largest wetland ecosystems. 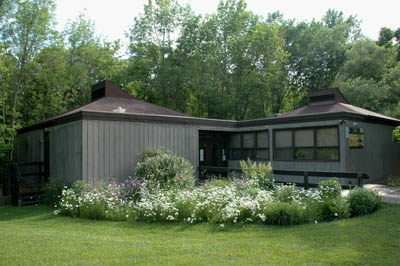 Originally a city-operated nature center, Green Point closed in 1988 due to budget cuts but was re-opened five years later with the U.S. Fish and Wildlife Service managing the facility as an interpretive center for the refuge. Along with the interpretive building with natural history exhibits, Green Point also offers a wide range of programs throughout the year and a network of short paths that wind 2.5 miles through the floodplain of the Tittabawassee River. For a brief period every spring the river rises and often the entire trail system will be under water or so wet you would need hip boots to go hiking. In late May and June the bugs can be brutal here. But the rest of the year the center is a quick escape for locals, especially families, who want to sneak off into the woods without leaving the city. Mountain bikes are not allowed on the trail system but in the winter the trails are popular with cross-country skiers when there is sufficient snow. Green Point features a variety of habitat and thus wildlife. You begin in a dense forest dominated by northern red oaks and hickory trees, pass woodland ponds, cross over a marsh, skirt the Tittabawassee River. Wildlife can range from a frogs and warblers to wild turkeys and whitetail deer. For the most part the described route below follows the premiere of the trail system for an easy hike of 1.6 miles. Three crossover spurs; Wildflower Trail, Turtle Trail and Deer Trail, allow you to shorten the outing to whatever distance your group can handle while the Songbird Trail by itself is a mile-long loop. The main trailhead at Green Point is found along the south side of the interpretive building where a posted wood-chip path heads into the woods. 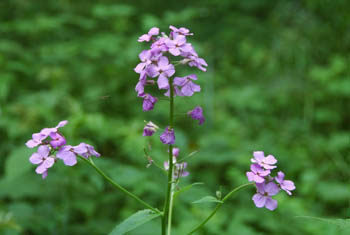 Following the Songbird Trail in a clockwise direction, you immediately pass the return loop and then junctions with the Wildflower Trail, Turtle Trail and Deer Trail within a third of a mile. At Mile 0.4 you pass a small woodland pond and reach a junction where the Song Bird Trail swings east (left). To the west (right) is the Raptor Trail that follows an old service drive back to Maple Street. Straight ahead are the river trails, reached by crossing an elevated boardwalk across a strip of wooded wetlands. 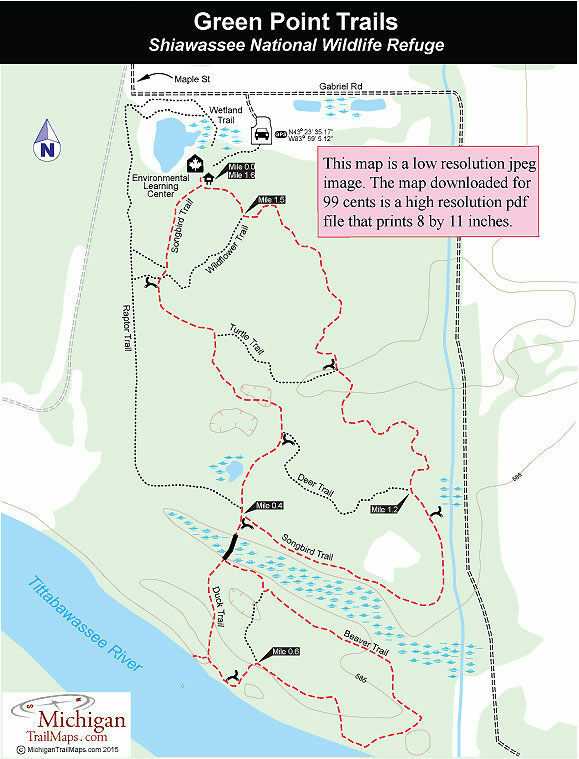 Two loops, Duck Trail and Beaver Trail, lead to the Tittabawassee River and then follow it’s shoreline briefly to the east. At one time there was a floating dock here but it was swept away during the 1986 flood. Today there is a bench along the river where you can plop down, rest the feet and look for wildlife. The view of the river here is as nice as anywhere along the waterway, known best for its walleye run that attracts thousands of anglers from fall through spring. The Beaver Trail follows the river, swings back along the wetlands and then returns to the junction with the Songbird Trail at Mile 1. To the east (right) the Songbird Trail breaks out of the woods to skirt an open field and then swings north to follow a drainage ditch briefly. At Mile 1.2 you reach the junction with Deer Trail and the other crossover spurs quickly follow. The trail remains in the bottomland hardwood forest before emerging at the backside of the interpretive building at Mile 1.6. For more information contact the Green Point Environmental Learning Center (989-759-1669) or the Refuge's website at www.fws.gov/refuge/Shiawassee.